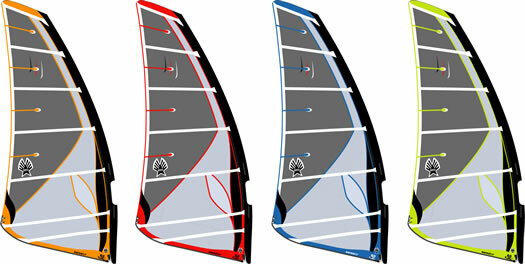 The new Infinity is built with Technora® sailcloth. Technora® is a para-aramid fiber that weight for weight is 8 times stronger than steel and 3 times stronger than nylon and Dacron. Since Technora® is so light, we are able to save considerable weight in the sail. Furthermore, the low stretch of Technora® means there is less stretch distortion along the leech when a gust hits. This produces a more stable feeling sail. The Infinity’s deep, draft-forward profile provides superb low-end power and when flattened with outhaul, the Infinity handles overpowered sailing like a dream. The Infinity’s narrow sleeve won’t fill up with water which makes water starting and uphauling easy. The camber inducer system will fit any SDM or RDM mast made within the last 15 years. How does the new infinity compare to our previous Infinity? Much lighter and easier to handle in jibes and tacks. More stable in straight line sailing. Body panels made with Spectra X Ply. Removable triple block tack pulley with D-ring option. Color coded outhaul and downhaul rigging indicators. Every sail is rigged and checked in our factory. Red plastic camber inducers, which sit inside the luff sleeve, behind your mast. The cams come in three sizes which are marked: “Standard”, “Medium” and “Skinny”. A spacer made of sailcloth. The arms of the cam fit into the cam pocket. There are 9 different sizes of cam pockets, marked “A” to “I”. Having the correct length cam pocket allows you to set the right amount of sleeve tension for the sail at the cam. If the mast sleeve at the cam is too loose you would change to a shorter cam pocket. If the mast sleeve is too tight you use a longer cam pocket (see the bottom two diagrams on the back page). Note: In addition to the cams and cam pockets that are in your sail, you will find an assortment of cams, cam pockets and a measuring ruler in the velcro pouch of your sail bag.Step 1. Use the included ruler to measure your mast’s circumference at both cam locations. labeled “LOWER CAM” use pocket “D” and the cam marked “STANDARD”. The Infinity’s removable and user-friendly cam system fits any mast made within the past 15 years, including RDM masts.